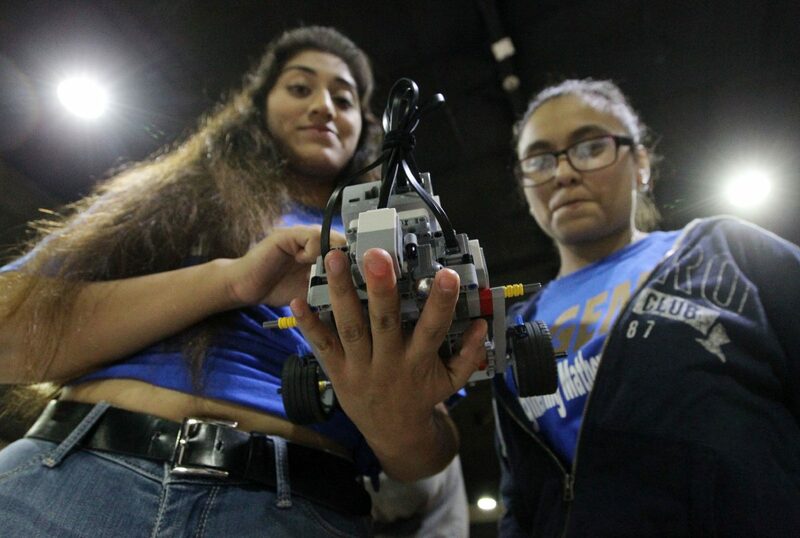 Carmen Uribe,17 and Donna Garza,17, of Valley View High school check on their robot "eva" before the start of the HESTC Robotics competition at the Pharr Events Center on Monday, Oct. 01, 2018, in Pharr. IDEA North Mission students gather around, frantically brainstorming what combination of commands to tap into their iPad. The group hustles together attempting to gauge the distance of a nearby incline their LEGO Mindstorms EV3 — an educational, programmable rolling robot — must scale, turn around and head back down. As a team, they increased and decreased the path and range the bot traveled, sometimes veering off course. Ashley Gangoo, 13, held the tablet controlling the bot. Her team blurted out guesses on how to prevent veering and increase distance. There was some debate about whether the cracks in the floor of the Pharr Events Center tripped the mounted color sensor, but like the other competitors troubleshooting their bot during Monday’s Robotics Day, they could only bet their hypotheses would pay off. Robotics Day was part of the first-day festivities kicking off the University of Texas Rio Grande Valley’s Hispanic Engineering, Science and Technology, or HESTEC Week. This is the 17th annual celebration of STEM — science, technology, engineering and mathematics — for thousands of students, educators and community members. Navarro said the time crunch of adjusting between rounds tested teams, and was good experience simulating an engineering team. More than 40 middle and high school teams from as far as Laredo had weeks to build their bot from Lego Mindstorms EV3s kits. Programming robots is a fun, approachable way to hands-on STEM education, Navarro said. Educators could teach the same concepts repeatedly, but providing an immersive experience and competing against other students gives them a taste of the competitive field. Norma Jean De Leon, academic content coach with UTRGV GEAR UP, said federal funding allowed 13 teams of Brownsville, Edinburg and La Joya middle schoolers to compete. She said her hope was that the experience would spark an interest in engineering and STEM for local boys and girls. The event used to be larger, but she doesn’t think it’s because of a lack of STEM-focused activities. While some potential teams don’t have the funding, other schools already compete in other kinds of robotics contests, like FIRST Robotics Competition. Milton Hernandez, program coordinator with UTRGV’s Division of Governmental and Community Relations, said teachers inquire about how organizers will make the contests more challenging every year. “This pushes them more to learn,” Hernandez said. Each round required modifications to their robots to complete four specific tasks — navigating a maze, scaling and descending an incline, tracing a line and a search and rescue. Teams could change tires, weight or other attributes depending on the obstacle. Donna High School student Marcus Ysaguirre, 16, said the process was a lot of trial and error. In the beginning, there “were disagreements, but we came together and really thought what would be the best concept for our robot,” he said. When asked how they did this year, the team’s sentiment was simple: better than last year. “They’re able to learn from their mistakes and they’re able to correct it right after,” Hernandez said. “The reason we did this was to challenge them when they’re sitting down — when they’re not really competing. Climbing the ramp didn’t work out for Gangoo and her IDEA North Mission teammates. She confessed she didn’t initially think they’d successfully build a bot. And like her doubt about the team being proven wrong, so was her idea that she could never be an engineer, she said. “I thought it would be too hard or impossible, but now I think maybe it’s a possible future career,” Gangoo said.